So here I am writing from Florida...There is more fresh snow at home I hear, and today we were swimming in the hot tub, sweating in the sun wearing shorts, finding horseshoe crabs in the mangroves, and tossing fossilized shells into the bay at the reflection of the sun. We had dinner with my cousin and her baby, my parents, my grandma. So many people to love around us all the time. We have been in the USA since November 20th, and now it's January 28th. The baby has progressed so much, today she even took a few steps. She will walk before we return. We did an amazing one month road trip, one month of family Christmas/holidays and beach time, and we are half way through one month in town at my parents and are seeing old friends, taking care of business, and hanging out. I am sitting at the computer in a daze looking on line trying to do some shopping, trying to remember back to my life in Sweden, imagining myself standing in my own kitchen, and wondering what material goods I can bring back that I will miss once I return to Sweden. What comforts can I gather here to make returning easier? It's like packing a time capsule for myself. Chocolate chips, baby clothes, refreshed English language media for SwedeGirl in the form of books and DVDs...what else...craft and art supplies for her, vitamins and supplements and herbs for me, shoes for everyone. Glasses and contacts for SwedeDaddy. And while I am here I still have to do taxes, see the accountant, get the American insurance and will in order. And plan a trip to Disney World. We go next Monday I think. This weekend is a fundraiser for Haiti an old client is organizing; I am hoping to see the last of friends I have not seen yet there. We have been busy making the circuit visiting old friends and family. We have had so many amazing moments. Blogtastic good times, and deep love and sweetness. Now, a good friend who her first baby around the same time SwedeGirl was born (I was her midwife) is due any day, and I am on call to go to the birth. I am preparing taxes, wills, Disney, and for a birth. And for my girl to turn 5, we will celebrate with all her friends at a big party. And I need ot sort through the mountain of things we have acquired here, and jam them into the suitcases. Then return to my home in Sweden. I have two weeks left. Never has a two week vacation seemed liked a short time, until now. 6) The choice of 100s of naughty breakfast cereals. Yes, I have eaten both Golden Grahams and Panda Puffs. Yep, that’s more than 5. 1)The many things for sale all the time in the USA. The commercialism is so pervasive. 4)That people are listening to Glen Beck, and liking Sarah Palin for real here. That the think the only way Europeans have healthcare is to pay 50% or more of their income to taxes. Politics are so crazy here. 5)That the road is a solid wall of businesses, and things for sale. The commercialism, I mentioned it before but it is so chi sucking I must mention it again. 6) That Americans look so unhealthy. I am no small woman, but in Indianapolis, I was the smallest woman on a carousel. Everyone was shaped like kind of an amorphous blob. There is a special shape of the Midwestern blob person. Nothing quite like it in Europe. That's not much of a top 5, but that’s how I am in the home stretch here, a bit discombobulated and anxious, nervous, and glad all at once the end of the journey is in sight. What is store for when we return? What exciting things next? In case anyone is listening, I just want you to know, I can take it. The good, all of it, I can take it. I am just not sure it will fit in my suitcase. In Sweden, we had one big snow last year. I hear there has been snow on the ground since before Christmas and people have shoveled snow more times than they can count this month. The white here in my former home in Florida is a bit different. Temperatures have dipped into record lows of the 20's F, and people here are complaining it is really cold. Thanks to Home Exchange . com, we are staying on the beach, and a lovely couple who own the beach rental we have been at for the last two weeks will stay at our house when we go up north next June to celebrate Midsommar. We may have our fair share of the white stuff here, but there is also plenty of color to liven things up as well. 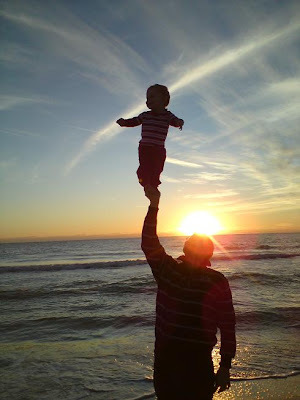 And my husband is having some time to practice his parenting skills, thanks to the nine months of father leave /Papaledig he has in Sweden. Thanks, Sweden. We love you. But Florida, you will always have January. What happens when you call an old friend, actually two, who I met when I worked at Outward Bound, and say you are going to stop in after not visiting them in ten years since you helped them have their first baby? She checks her calendar, looks two months ahead, and declares 'Well I have to milk a goat that day, but other than that I am free!" and offers an enthusiatic welcome. Diana is a kitchen goddess, and her new style is Traditional Foods ala Weston Price, which means there is a lot of soaked grains and fermentation going on in her kitchen. I love a woman with a jar of beet kavass fermenting on her shelves! And tintures brewing with home grown herbs. Her shelves were so lovely, full of homemade jams from the community garden she maintains and the friends she meets there, I just had to include some pictures. She has always been a baker, but when we were there bread appeared like magic. She had just made two fresh loaves when we arrived, but everytime you'd turn around a friend and lovely sould would come in the door and suddenly there was a loaf gifted in love. Always enough loaves and fish, you know. And did I mention she made us cannelonni and made the crepes from scratch (from soaked flour of course) casually while we chatted. If you ever get caught in a blizzard like we did, and have to add a few extra days at a home along your road trip, may it be with a very good cook like Diana. We stayed a few days and got our winter fill of snow, and when we left we saw the cars of many unfortunate people had spun off the road in the storm the night before, there were some stretches of road where it was like a parking lot on the highway. We had a very authentic feeling Santa Lucia in Washington Dc. 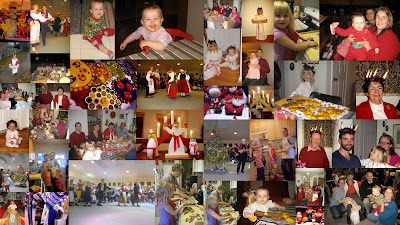 We made pepparkakor at home, went to a scandanavian festival with a Lucia performance, dancing around the Christmas tree, and holiday crafts. Then little Lucia made her rounds for the family. We made a stop over in Jacksonville to see my college friends. Their daughter knows if she wants to a sure fire way to capture her parent's attention, she can always request 'a science experiment'. So they have a nice repetoire of things to explode, change colors, and mush and gush around. We got to be there for the mentos volcano, where you add a roll of mentos candy to a 2 liter of soda (diet is recommended so sugar does not go everywhere).